There are a few main ways to blend Copic markers. 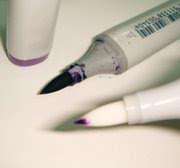 By blending, we mean have one marker color slowly fade into another color on your paper. A great, simple technique for small areas is Marker to Marker Blending. This works with any two Copic markers, though I am using the brush tip of sketch markers. I am choosing a blender pen as one of my colors because I want the colored area to fade to white (If I wanted it to fade to yellow, then I would choose a yellow as my "brush" color). Always use the lighter color to pick up darker colors- that way you can see how much color you're picking up, though on darker color combos it will be hard to see on the tip, but it will show up on paper. the audience. NO, I have NOT just ruined my blender pen, it will come out, even though this is a dark purple. see how much/how quickly it will fade out when used (try it on scratch paper before you apply it to an image). Next, choose a pic that you want to color, and touch your marker at the darkest point you want, then color out towards the lighter side. 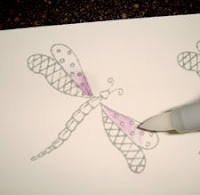 In this case you can see that I colored the dragonfly from the wings base out toward the tip. 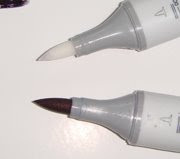 If you're done blending with that color but your tip still looks dirty, just scribble onto some scratch paper until the color comes completely off (a paper towel is good for this as well). Here is my blender after finishing coloring the dragonfly. Pretty clean, isn't it. I just love how you won't ruin your markers or cross contaminate them when doing this technique. Also, that purple was REALLY dark. If I had tried to blend it out to white with one of our other methods it would have been a lot harder. As it is, the violet on the paper is nice, subtle, and beautifully blended. Another way to clean markers-I just have to let you know that I kinda lied to you just now. OK, if you read carefully I didn't lie, I just mislead you. Look carefully at the first picture of the purple marker. That's one grungy marker. This is one of my well-used workshop markers. I want you to take a close look at that last picture of the purple marker. It's much cleaner isn't it? I have to confess that for this tutorial I was not actually touching marker tip to tip (though I could have). I was using this technique to clean my dirty marker. What??? I was using the blender pen and pulling the crusted ink off the marker barrel to color with. Talk about not wasting a drop! Do you want to know how much I was able to color from that one end of a dirty marker? 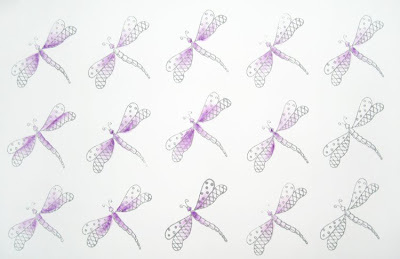 Enough purple to color all these dragonflies! I just found you! Where have you been all my (Copic) life? Thank you for blogging and teaching us! You are a lifesaver. This is going to be fun. I'm really REALLY looking forward to your ongoing lessons. Thank you, thank you. One request: please continue to be very clear about what numbers/colors you are using in each instance. It's very frustrating when bloggers say "colored with my Copics." Thanks again. I just discovered Copic markers, have invested in about 25 of them and then happened to find this blog. It's just what I wanted (and needed). Thanks for all the clear directions. Thanks for a wonderful tutorial! I'm slowly starting to use my markers. I was sort of "afraid" to use them, but the colours are so wonderful and the techniques that people share are great. I love your blog! It will be one that I check daily!! Love that you have a blog! I have a problem with a few of my copic markers and wondered if you could tell me if there's anything I can do to fix it. When I'm coloring an image, sometimes the marker will drip a big drop of ink on the paper! Does this mean it's too full of ink or the tip isn't in all the way? It can sure be aggravating when you've almost completed an image to have that happen. Thanks for any suggestions. You're experiencing a pressure change in your markers. Do you live in an area that is having sharp pressure changes from weather? Have you been flying with your markers? I am so excited about your blog. 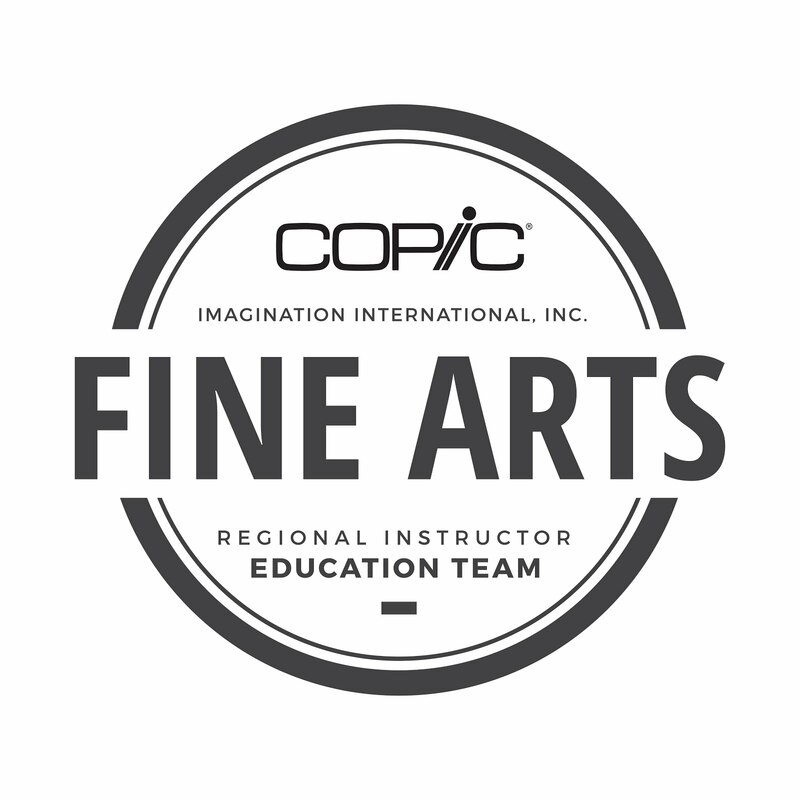 I need the tips! I do OK with my Copics, but I could improve a lot. I have seen such beautiful things from others stampers, and I want to be like them. Thanks for giving in to blogging. WOW!! I am in love with your blog already!! Thank you!! Thank you!! Thank you!! for starting it!! I predict that your blog is going to be the most popular ever!! I have one question (well more than one ... about a hundred of them), but I'm trying to stay on topic as you post. :) In your first post you noted in your first tip "for cleaning your dirty Copic Markers, try Hand Sanitizer. This stuff has alcohol in it, and Copic markers are alcohol based. Depending on the brand this will also moisturize and smell nicer than rubbing alcohol." However, in this more recent post, you taught us a totally different way to clean a "grungy" one (your words). ~ smile When would you use the Hand Sanitizer to clean your markers and how would you do it? Thanks again for starting this blog. 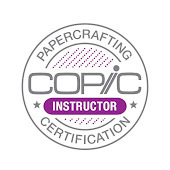 The word is spreading like wildfire among all of us Copic Coloring Wannabes. I've been using my blender pen like this except I was scribbling some colour onto an acrylic block and lifting with my blender, sometimes 2 colours together to get a stripe effect. Why didn't I just think to lift the crusty old ink from around the nib!!! Thanks for the wake up!! what an awesome tip on how to be Green with our markers and use every last drop. I'm so glad that you have a blog now! These tips are so helpful, thanks so much! 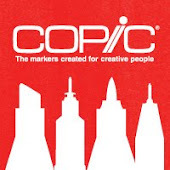 do anyone know which percentage of ethanol they use for copic...? 70%? 90%? 100%? can i actually use ethanol for refilling the blender? gonna use this for work in my blackbook for fades from color to white and faded halos. Thank you for the example on blending with markers I will be trying this technique for my tattoo art. I am also going to share your technique with others. Again Thank you an I look forward to more of your examples.